Home › Flash › Microsoft getting stick for using Flash again. Microsoft getting stick for using Flash again. Somehow I missed it but Microsoft launched a new phone platform recently (Kin). This comprises of two phones that have quite different factors but have one main purpose, to be the users social hub. To promote the new phones Microsoft have put together a web site that gives the usual brochure-ware details about the product etc. 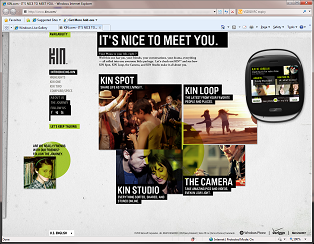 The Kin web site has been created using Flash as a method of delivering the rich experience rather than Silverlight. This has created the usual mutterings from people on Twitter with as you can guess the word ‘Fail’ being used quite a bit. This really does rattle my cage. I for one can see why Microsoft have used Flash for the front end of the site and yes it is because of the market penetration that Flash currently has over Silverlight. Imagine if you had a brand new product and you wanted to sell it to the masses but you told the people at the top that although 60% of the web population will get to see it straight away the other 40% will have to download an app first. You have to agree that the people at the top would ask you what pills you have been taking recently. You so have to go with market share on this one. I am however reserving my bets for the fact that Kin Studio will be written in Silverlight. Kin Studio is the online face of the social aspect of the phones and it looks to be a good showcase of what can be achieved with the Microsoft technology stack including Azure, Silverlight and the new Windows Mobile 7 (platform). If Microsoft have used Silverlight for Kin Studio they will be increasing their penertration of silverlight and you never know maybe oneday they will have enough of a share that they will launch a new product / site with silverlight as the 1st thing people see. I just hope I am not let down! BTW: I imagine I will get some flames from this but hay I am sure it won’t be as much as Microsoft themselves. ‹ And so it starts! Pretty sure that if you have SL installed then it’ll use SL, if not then it’ll use Flash (if installed). I’ve seen folks from MSFT do this on a number of sites. Of course, that won’t stop the haters from hating!